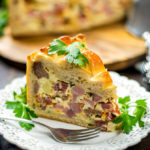 Some people call it Easter Pie or Italian Easter Pie. 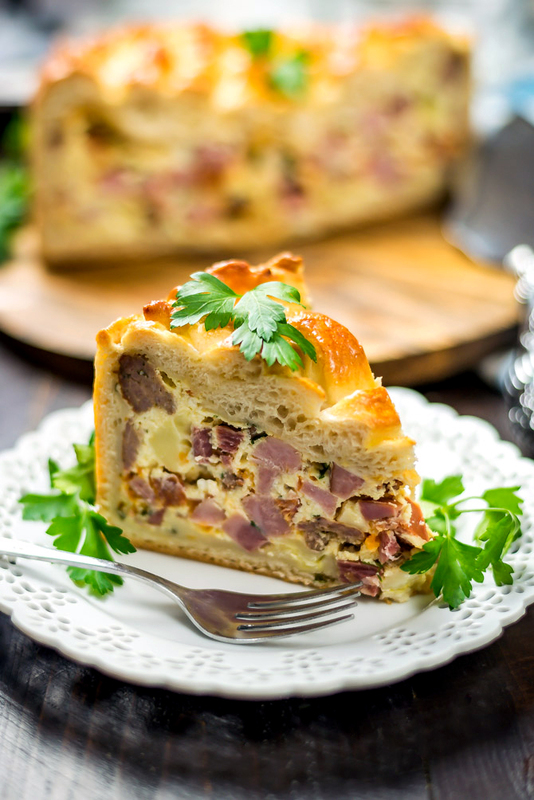 Others say Pizza Rustica. 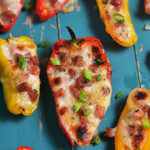 Then there are those who call it Pizza Pieno, Pizza Gaina, Pizza Chiena, or Pizza Chena. Would a pie by any other name smell as sweet? I’m not sure, but it would definitely taste just as good. What you call it is pretty inconsequential– it really all comes down to where in Italy specifically your family came from. Personally, my Nonna didn’t call it any of the above. Mainly, you know, because I don’t have a Nonna. I almost feel like an imposter sharing this recipe with you guys because it’s not a meal that we’ve eaten for generations, shared with me by my Italian grandmother. I’m not even Italian at all. (Well, I suppose that’s pending the results of my DNA test. But I’m preeeetty confident.) 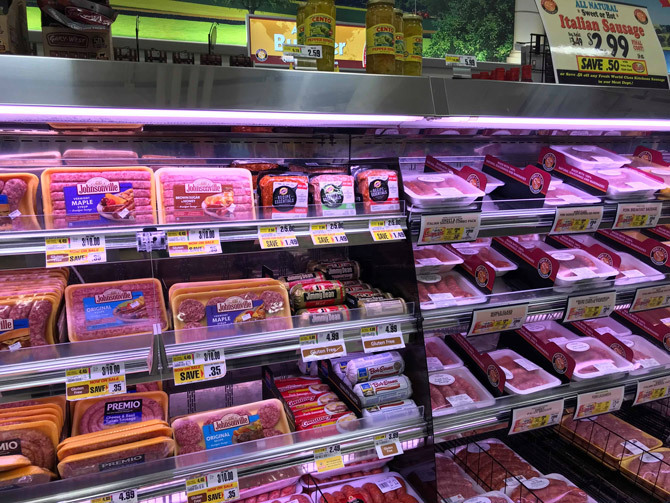 However, my housemate Mike is, and every Easter he brags endlessly about how this edible shrine of Italian meats and cheeses is the real deal. The ultimate Italian dish. The one thing the rest of us have no clue were missing. I fully expected this recipe to be incredibly hard, because the end result is so impressive. However, it’s actually super simple – the kind of recipe you can make with kids (they’ll love stretching out and shaping the crusts) or make in bulk for the whole extended family. The keys to keeping it so easy? Use premade pizza or bread dough that you roll out thin. I know this might seem a bit blasphemous, but I made my own dough for the crusts twice and found that the extra effort was unnecessary. Keep it our little secret. 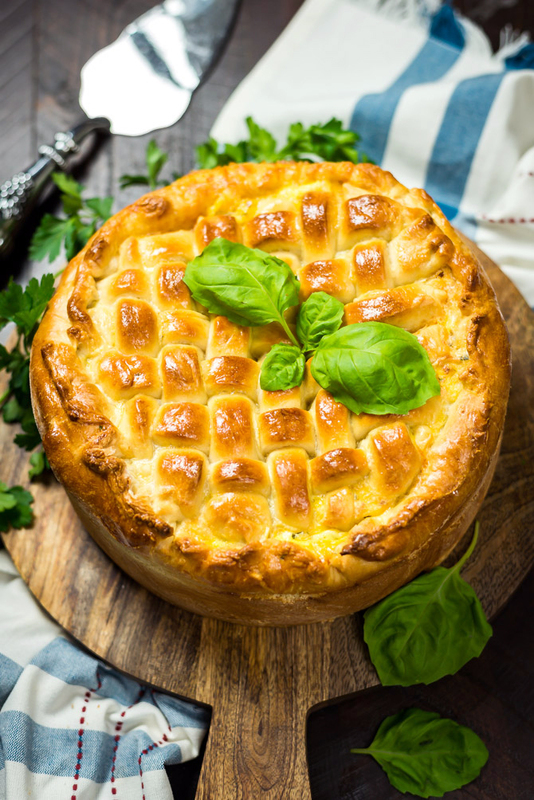 Some people layer the ingredients in their Easter Pies, but cubing the meats and solid cheeses, mixing it all together, and pouring into the crust saves time and gives better textures in the end. 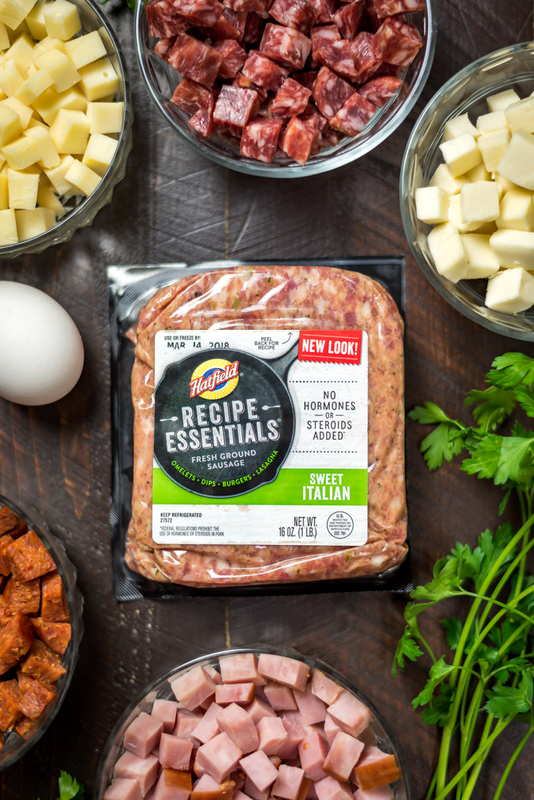 Along with the Hatfield Sweet Italian Ground Sausage and Hatfield Uncured Ham, I like to fill my pie with pepperoni, sopressata, sharp provolone, fresh mozzarella, ricotta, parsley, and eggs. 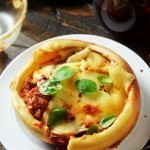 It’s almost like a towering version of a stromboli! 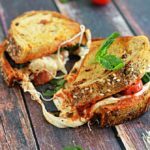 Feel free to get creative and mix in other meats, spinach, roasted red peppers, or whatever you think your family would love most! 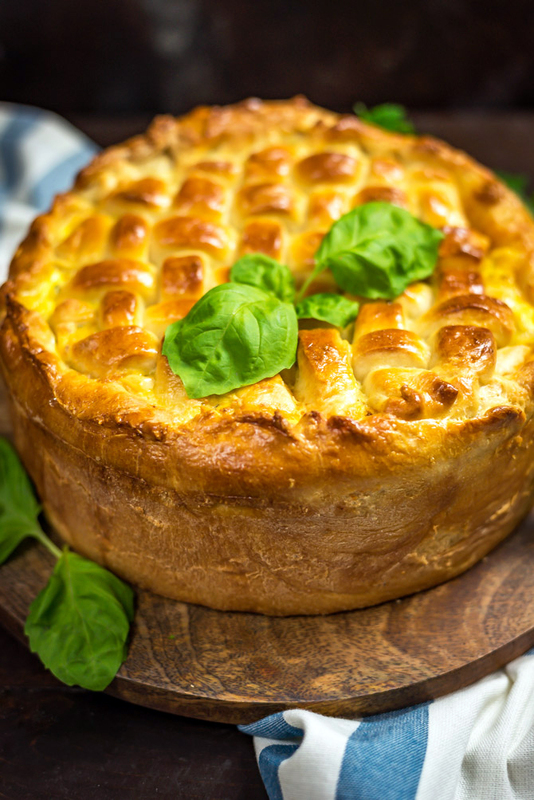 Whether you’re Italian or not, this recipe is the perfect holiday meal to serve your family (and the resident Easter Pie expert devoured several slices, so I am going to say that it’s Italian-American approved). Make it for Easter, for a family get-together, for a picnic or party, or just to slice up for meals throughout the week, which is what I’ve been doing. It truly is the ultimate Italian treat (no matter what you choose to call it)! Preheat oven to 350°F. Lightly grease a springform pan and set aside. Cook the sausage in a large skillet over medium-high heat, breaking the sausage up as it cooks, until browned on the outside and no longer pink inside. Roll out half of the dough on a lightly floured surface with a lightly floured rolling pin into a 1/4 inch thick round. Fit dough into springform pan and trim excess, leaving a 1/2-inch overhang. Cover with a kitchen towel and set aside. 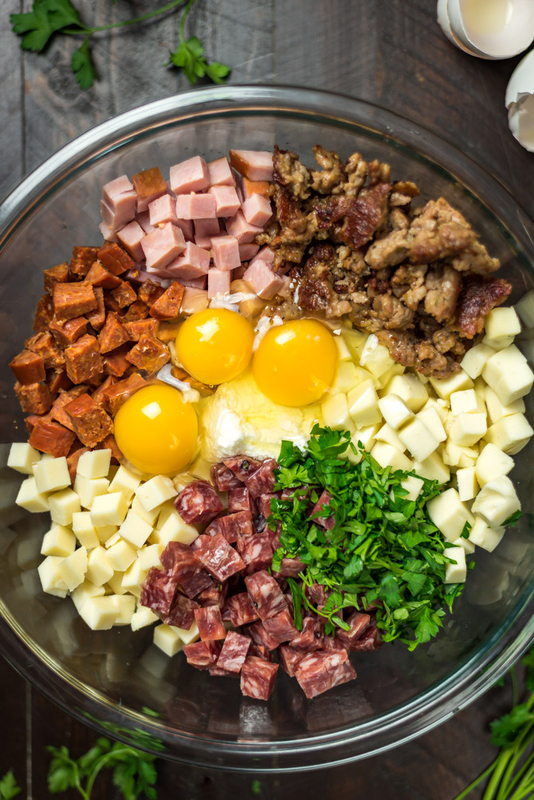 In a large bowl, stir together the ricotta, 3 of the eggs, cheeses, sausage, diced meats, and parsley. Spread filling evenly into the dough-lined pan. Roll out the remaining dough and cut into strips. Make a lattice to top the pie and fold over the excess dough from the sides to seal. Brush the top with the remaining egg. Garnish with herbs and slice to serve. You don’t need Italian DNA to enjoy good Italian food. Thanks for sharing the recipe. I agree, Margaret! Thank you!